Air pollution threatens people’s health in many cities, according to an unprecedented compilation of data released today by WHO. It has collected data on air quality from nearly 1100 cities in 91 countries across the world, including national capitals and cities with more than 100 000 residents. At both the global and European levels, the great majority of urban populations has an average annual exposure to PM10 (small particles with a diameter of less than 10 μm) that exceeds the maximum level recommended by the WHO air quality guidelines (20 µg/m3). Worldwide, only a few cities meet the WHO guideline value. 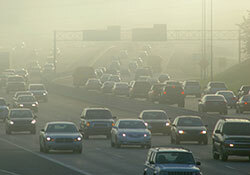 In the WHO European Region, exposure to PM10 from man-made sources is estimated to result in an average loss of 8.6 months of life expectancy. The new WHO database includes data on PM10 for 357 European cities in 33 countries. In these cities, over 80% of people experience PM10 levels above the WHO guideline value, and more than 250 000 people die every year as a result. “These data cover the key European cities and show that people in most big cities are exposed to unhealthy levels of air pollution, which causes cardiovascular diseases and increases the risk of respiratory health problems. This evidence is a strong argument for policy-makers across the Region to work for cleaner air and better public health. The lack of data for cities in some countries in the Region hinders prevention and shows the need for improved monitoring,” said Michal Krzyzanowski, Head of WHO/Europe’s Bonn Office. In WHO/Europe’s policy documents, Member States commit themselves to reducing the health effects of air pollution. For example, full implementation of European Union (EU) policies on pollutant emissions, based on the evidence provided by the WHO air quality guidelines, would reduce the adverse health effects of exposure to particulate matter by 30%. Such policies include a wide range of measures to reduce emissions from industry, energy production, housing and motorized transport. They both benefit health and help to mitigate climate change. For example, replacing short journeys by car with walking or cycling and more common use of public transport not only reduces greenhouse-gas emissions but also increases physical activity, prevents obesity and reduces the risk of cardiovascular diseases. This approach would also apply to other countries in the Region.